Only a few mention high taxes as the most important problem facing the county. These are the findings of a scientific survey conducted in late October and early November by graduate students enrolled in two sections of a social science research methods class in the Grady College of Journalism and Mass Communication at the University of Georgia. I was the instructor for one of the sections. The students surveyed 526 registered voters in the county. Most of the questions asked dealt with the opinions of the voters on a variety of national issue, but two dealt specifically with Oconee County. The first asked voters to name the most important problem facing the county, and the second asked them their opinion on the transportation tax. Of the voters surveyed, 25.1 percent said they would vote for the tax, and 23.4 percent said they would vote against it. The remaining 51.5 percent said they had not yet made up their minds on the issue. That split of opinion stands in contrast to votes on special tax issues in the county going back to 1982. Voters have cast ballots12 times on sales tax issues and renewals since that time, and they have never given any of them less than 61.9 percent support. In March of 2009, 71.2 percent of the voters supported the current Special Purpose Local Option Sales Tax, and on Nov. 8 of this year 71.4 percent of the voters approved the renewal of the Education Local Option Sales Tax. Both were also 1 percent taxes. Much can happen between now and July 31, when voters around the state are scheduled to go to the polls to decide on the transportation tax, and Sen. Bill Cowsert, who represents Oconee County in the Georgia General Assembly, told local officials earlier this month that the date of the vote might even be moved. 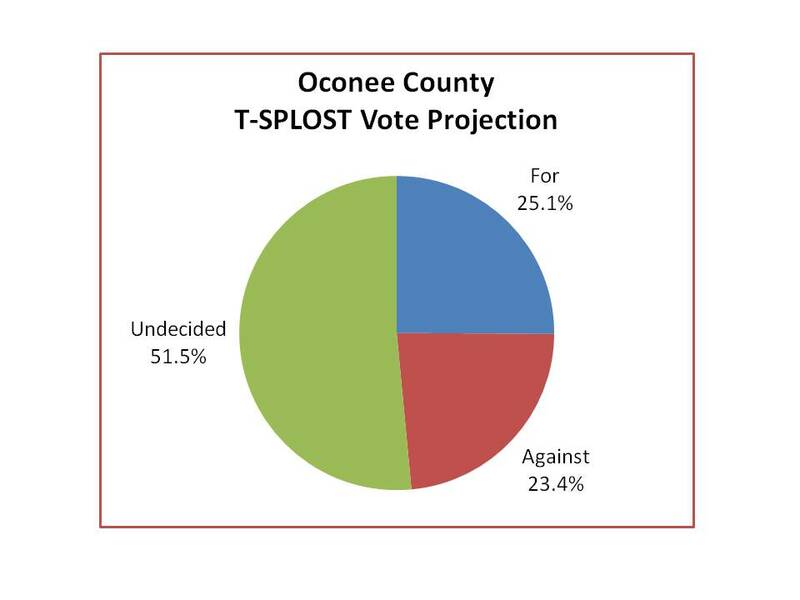 The survey indicates, however, that there is as much opposition to the tax as support for it at present in Oconee County. The sampling error for the survey is 4.3 percent, meaning that the percentage of those favoring and the percentage opposing could be about the same. The votes of Oconee County voters will be lumped with those of voters in 11 other counties in northeast Georgia in the tally to determine if the tax goes into effect. The eleven counties are Barrow, Clarke, Elbert, Greene, Jackson, Jasper, Madison, Morgan, Newton, Oglethorpe and Walton. Oconee County accounts for only about 7 percent of the registered voters in the 12-county district, according to my analysis of voter registration lists. Clarke County has about 19 percent of the voters, followed by Newton with 18 percent, Walton with 16 percent and Barrow with 11 percent. It is also difficult to estimate how many people will go to the polls to vote on the tax. July 31, when the T-SPLOST issue now is scheduled to be on the ballot, is designated as the general primary for the state. Oconee County voters will be deciding on candidates for three members on the Board of Commissioners, including the chairperson, and on three members for the Board of Education, also including the chairperson. The races could generate quite a bit of interest. Voters in the 12 counties are being asked to approve the new one percent sales tax to cover the costs of improvements to 67 transportation projects spread across the 12 counties that make up the Northeast Georgia Regional Transportation tax district. The Oconee Connector improvements will include a multi-grade crossing, eliminating the current traffic intersection. The interchanges on SR 316 at SR 11 and at SR 81, both in Barrow County, also are listed as projects to be funded. Both will be made multi-grade. If the referendum passes, 75 percent of the revenue from the tax will be used for the listed projects. The remaining 25 percent of the revenue will be returned to the counties and cities for transportation projects, based on a formula reflecting road miles in the counties and cities. The tax, if approved, will run for 10 years. In response to the question on the survey regard the most important problem facing the county, 293, or 55.7 percent, offered at least one specific response. The economy generally was mentioned by 9.1 percent of those surveyed. That same percentage, 9.1, mentioned unemployment and the need for jobs. The weak housing market was mentioned by 8.0 percent, and the county’s budget itself was mentioned by 3.6 percent. Too much growth was mentioned as a problem by 5.7 percent of the surveyed respondents, and 5.1 said too little economic development was the most important problem. Transportation problems were mentioned by only 19 of those surveyed, or 3.6 percent, and taxes were listed by only 15, or 2.9 percent. The county should “expand Mars Hill Road,” one voter said. Such an expansion will be funded by the T-SPLOST tax, if it passes. Another said there is “too much neighborhood traffic” in the county. Another said the county needed to reduce the “number of dirt roads,” while yet another said the county needed to improve transportation links between Oconee and Clarke counties. No one mentioned the T-SPLOST tax, either as a way of funding transportation or as a tax to be turned down by voters. The survey conducted by the students was part of an exercise to help them learn about research methods in the field of mass communication. Dr. Jeong-Yeob Han was the instructor for the other section of the class. What do you think is the most important problem facing Oconee County today? Voters in Northeast Georgia will be asked in August of 2012 to vote on a proposed one cent on the dollar Transportation Special Purpose Local Options Sales Tax. As of now do you favor this tax, referred to as a T-SPLOST, are you opposed, or have you not made up your mind yet? The August reference had been used as the date of the election earlier this year. Surveys have two prominent types of error. One is called measurement error, and can result from any misunderstanding or misinterpretation on the part of the respondents of the question asked. The other is sample error. 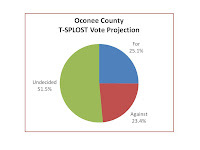 The sample error of 4.3 percent is at what is called the .05 level of confidence, meaning that the odds are 19 to 1 that the sample statistics, plus or minus the sample error, would include the actual answer to the survey question had all Oconee County voters been surveyed. For this survey, the students drew the sample from the Oconee County voter registration list, which I purchased for them from the Georgia Secretary of State office on Sept. 18. The list contains full names and addresses of voters as well as gender, race and year of birth as a way of preventing voter fraud. The lists do not contain telephone numbers, but the students were able to find those numbers for many of the voters from electronic databases available on the Internet. The students completed 81.8 percent of the interviews via the telephone, 10.1 percent in person, and 8.1 by directing the voter to an online survey site where the voter could complete the interview. The students were able to complete interviews with 20.7 percent of the voters they attempted to locate and interview. The characteristics of the sample of voters interviewed matched closely the characteristics of registered voters in Oconee County overall. For example, 88.4 percent of the registered voters are classified as White, and 90.7 percent of those interviewed were classified by the official lists as White. Among registered voters in Oconee County overall, 52.6 percent are women. In the sample of persons interviewed by the students, 53.6 percent were female. Among Oconee County registered voters, 2.4 percent are under 20 years of age. In the sample of persons interviewed by the students, 2.3 percent were under 20. On the voter list, 23.2 percent are 60 years old or older; in the sample of voters interviewed by the students, 24.7 percent were of that age. The sample of persons interviewed by the students also matched the county’s full voter lists in terms of numbers of voters in the county’s 13 precincts and the number of active and inactive voters. The students began the interviews on Oct. 20 and completed them by Nov. 8. Oconee County had 22,730 registered voters on Sept. 18, when I purchased the list. My analysis of census data suggests that in excess of 95 percent of the eligible voters in the county are registered. I made a mistake in the original version of this report. I mistakenly identified July 31 as a runoff date, rather than the general primary. I apologize for the error, which resulted from a misreading of the chart on the Secretary of State web page setting out the schedule. The runoff date is Aug. 21. While this new tax is being treated by officials as a done deal, it isn't. With traffic issues a low priority, adding yet another one percent is not generating much enthusiasm. As a disclaimer, I was somewhat surprised by the ease with which the E-SPLOST passed. I suspect with the low turnout the number of educators voting made tha big difference. The T-SPLOST date will be important. Should it be included on a heavy turn-out day, the likelihood of passage probably diminishes. If it is the only issue, a tiny turn-out of supporters will decide affirmative. As always, thank you so much for all the effort you put into making us really well-informed. We know we can rely on your research, and you know how to do it much better than we could. Seems like we're always being asked to vote in another SPLOST but even when they're approved, the property taxes never go down correspondingly. Alas.